The Occupational Safety and Health Technology Program prepares students for a successful career of preventing incidents and saving lives. 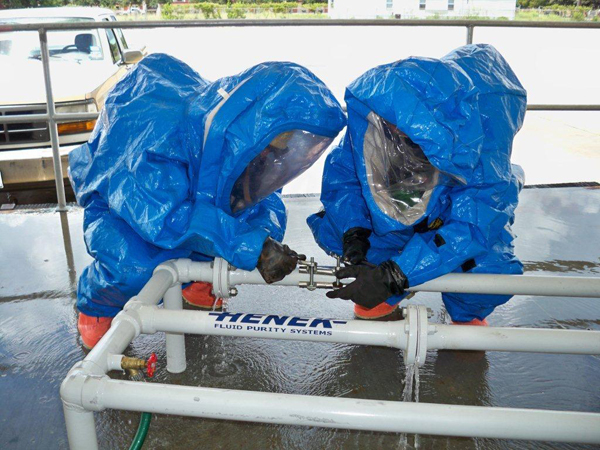 Vital in any industry, safety professionals find opportunities worldwide. The Occupational Safety and Health Technology Program trains students to identify, analyze and control workplace hazards. Students develop a strong background in safety, health and environmental topics as well as in the chemistry, math, science and English, including technical writing and psychology. 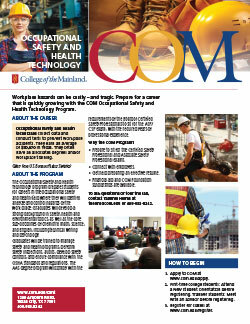 Students learn to manage safety and health programs, perform safety inspections and audits, develop safety controls, and ensure compliance with the OSHA standards and regulations. The certificate program is ideal for those who want to enter the field quickly or those who already have a bachelor's degree and want to change careers. The two-year Associate of Applied Science builds on the certificate and can transfer to universities. It complies with the requirements of the Board of Certified Safety Professionals, and graduates may sit for the ASP/CSP exam if they have the required years of professional experience. COM helps students launch their college education at a fraction of the cost of a university. Plus, students may qualify for scholarships or financial aid. For more information on scholarships, visit www.com.edu/scholarships or call 409-933-8508. For more information on financial aid, call 409-933-8274 or stop by the COM Financial Aid Office in the Enrollment Center. The Occupational Safety and Health Technology program has 3 scholarships available for students enrolled in the OSHT program and maintaining at least a 2.5 GPA. – Daryl Bladt earned the Occupational Safety and Health Technology Certificate and now works as a ChemCare health and safety specialist for Univar Inc.